Trying to eat healthy can be quite a struggle when traveling around the city. Thankfully, there are restaurants that offer vegetarian and vegan options. You just need to find them though but in the end, your persistence is definitely worth it. The pretty and clearly laid out menu is also big for easier reading. A visit to the picturesque Hillside Cafe & Juice Bar turned out to be worth the long walk in the middle of the day, under the hot sun. We treated ourselves to healthy and refreshing food to keep us energized for the rest of the day's work. They had a lot of vegetarian options on the menu such as the Roasted Potato and Globe Eggplant (Php195) which is "glazed with miso, set on a bed of organic arugula drizzled with balsamic vinaigrette, topped with beancurd chicharon." I had ordered this before and it was definitely flavorful and filling but I am not really a fan of eggplant. So this time around, I opted for one of my favorite vegetarian treats--falafel! The description for each dish in the menu was a great help in finding what I wanted to eat without having to ask about each item. Under the category Soft Tacos where you get "Two pieces served with cilantro brown rice, black beans and salsa", I chose Falafel (Php215) for my filling. The falafel balls are drizzled "with garlic yogurt, pesto, tomato salsa, lettuce". The sauce sounds like a weird combination but actually works. The falafel balls were a bit crispy on the outside and soft on the inside. 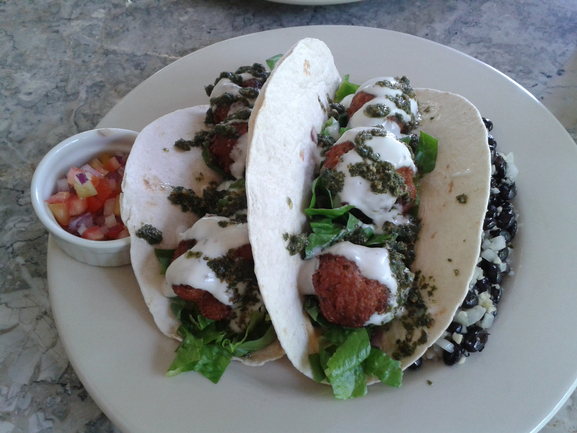 The sauce combo provide for a refreshingly mild, tangy flavor which complimented the texture of the falafel and taco. For an even more refreshing flavor, add the tomato salsa as topping. The cilantro brown rice was a nice break for the palette in between bites of the falafel and tacos. 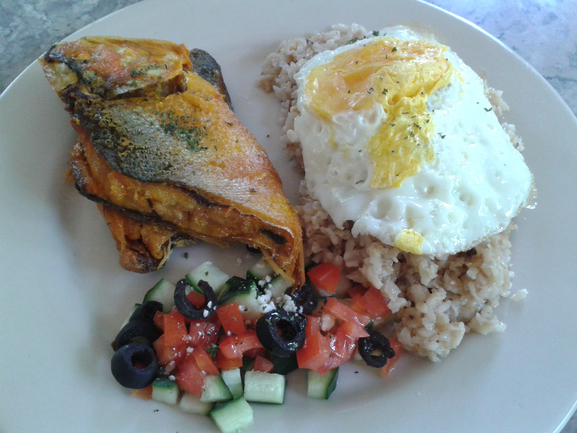 If you are craving for something meaty but still healthy then try the Smoked Milkfish (Php255) "served with garlic brown rice, free-range eggs, and cucumber-tomato salad". This was what my friend ordered since she wanted fish. She devoured it all so it definitely passed the taste test. 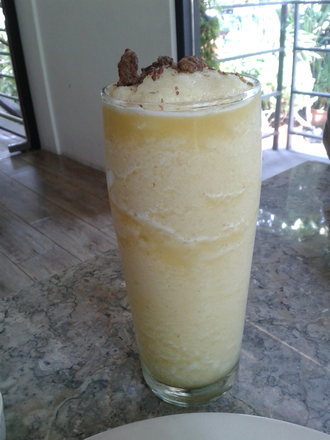 As added refreshment, I ordered their Mango Shake (Php135) which was delicious and very large. I felt full just sipping it so I took some time before digging into my main dish. I hope they don't change the generous size of the serving. There are more healthy options on their menu. 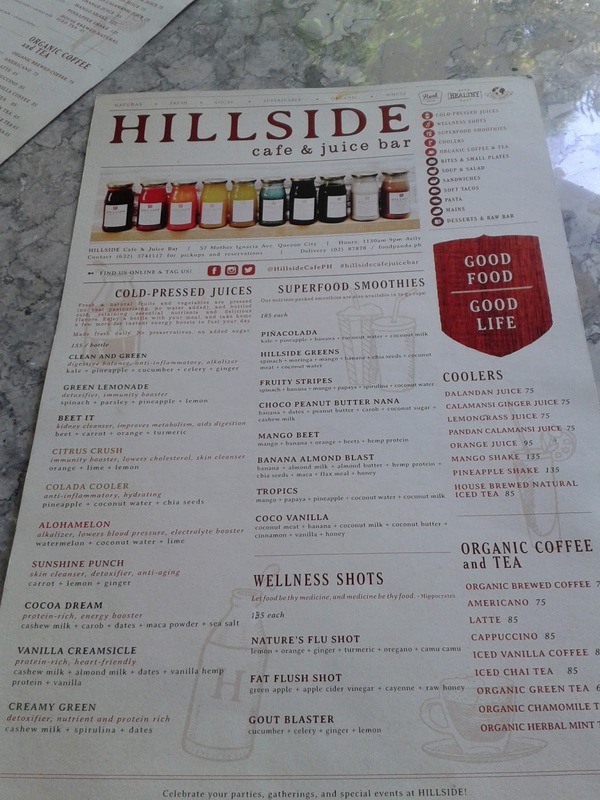 They are also popular for their cold-pressed juices and superfood smoothies. If you are ever near the Tomas Morato area, this is a great option for lunch, a snack or dinner. You can also buy organic household products and plants from the shop and plant nursery beside the cafe. It's better to get there early or have a reservation since seating is minimal with the bigger tables only for 4 people at most.